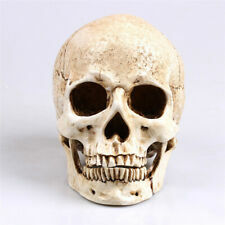 Life Size Replica Realistic Human Skull Gothic Halloween decoration Ornament UK! Decorative human skull sculpture makes a really eerie Halloween decoration. 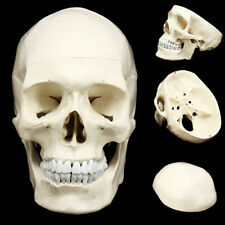 1pc x Skull Model. Color: As the picture shows. Made of resin, Full size 1:1. Material: eco-friendly resin. Material:Eco-friendly Resin. This anatomically correct life-size Human Head. Color: White. Size :Approx. Of the vast amount of prehistoric life that died, it is only a tiny amount that has survived the fossilisation process. This process can take up to several hundred million years. Fossils can be as tiny as a grain of pollen or a seed for e.g. or as huge as a limb bone from a giant dinosaur. Age: Devonian. 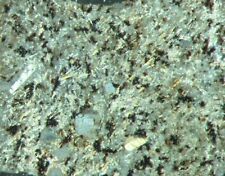 Fossils can be as tiny as a grain of pollen or a seed for e.g. or as huge as a limb bone from a giant dinosaur. Usually it is only the hard parts of plants and animals that survive this long process. 1 x Resin Skull Model. Material: Resin. Made of non-toxic resin, durable and practical;. Unique design with hand-carved pattern;. Color: as shown in the display pictures. 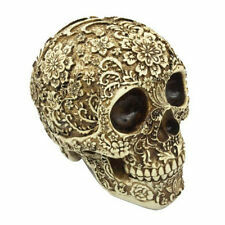 Ideal for decor, teaching and Collectible. Color:Show as pictures. Around 195 million years old (Sinemurian, Early Jurassic), this fossil would make a wonderful addition to any collection. It has been coated with a soluble (removable) lacquer for protection. Old (3.4 billion years) stromatolite and showing the laminated beds. The fossil consists of a single partial head, all preserved preserved with great detail. It has been coated with a soluble (removable) lacquer for protection. Around 195 million years old (Sinemurian, Early Jurassic), this fossil would make a wonderful addition to any collection. Horn Coral natural fossil. 21.3 gms (0.75 oz). 32mm x 24mm x 24mm, 21.3gms (1.26in x 0.94in x 0.94in, 0.75oz). All sizes and weights are approximate. Horn Coral. This is the item you will receive. Images are taken under artificial light, colour may vary when viewed on different monitors and under different light conditions. Superb Boxed Piece of Baltic Amber - With A Real Fly! This is a super litle piece of polished Baltic Amber. Boxed and labelled in a padded gem jar - and would make a super Christmas gift for any fossil fan! It contains a small fly. Superb quality! Excellent price! 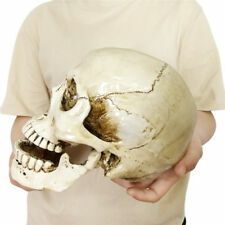 1:1 Simulation of human skull. For bar, performing arts scene decoration. Material: Resin. Suitable Occasion:Party or Halloween. A great help for Archaeologists. Size: 16 14 20cm. Material:Eco-friendly Resin. This anatomically correct life-size Human Head. Color: White. Located from Brown Bank (Doggerland), North Sea, between England and Holland. ​Mammuthus primigenius tooth. Rare Illustrated Paperback book, Exact scan as an e-Book /PDF Will open on any pdf reader such as Adobe Acrobat and most ebook readers. Very usefull addition for anyone interested in fossils, with many forgotten localities. Fossil Crab Notopocorystes Stokesi Gault Clay Folkestone UK. Condition is Used. Dispatched with Royal Mail 2nd Class. Fossil Crab Etyus Martini Gault Clay Folkestone UK. Condition is Used. Dispatched with Royal Mail 1st class. Rare fossil crab Dromolites lamarcki eocene Isle of Sheppey !!!!!!!! Dromilites lamarcki - Eocene, Isle of Sheppey, Kent. Dromilites lamarcki (Desmarest) in beach nodule. Warden Point, Isle of Sheppey, Kent. Period=Early Jurassic (Hettangian). Preparation =Matrix removal & varnish. Origin= Gloucester UK. Age=200 Million Years. Each lot will be picked at random. Cycloseris Cyclolites Coral genuine fossil. 13.6 gms (0.48 oz). Cyclolites Fossil (Coral). 32mm x 32mm x 6mm, 13.6gms (1.26in x 1.26in x 0.24in, 0.48oz). All sizes and weights are approximate. This is the item you will receive. Images are taken under artificial light, colour may vary when viewed on different monitors and under different light conditions. Each kit is designed for a class consisting of 10 microscope stations, and we estimate up to 3 students could effectively share each sample, so up to 30 students could use each kit. We have had several requests for collections that can be used by students as an introduction to microfossils. CRINOID STARS. The fossils stars are part of crinoid columnals. Age: Lower Jurassic - 201.3 to 174.1 million years ago. Crinoids are marine animals that make up the class Crinoidea of the echinoderms (phylum Echinodermata). Holocene foraminifera microfossil sample Japan Superb Star Sand with SEM photo! Collected from one of only two beaches in the world where this material is found. The foraminifera are large, complete and of weird and wonderful types. This is excellent material. Rare fossil fish skull remains Rhinocephalus planiceps eocene Isle of Sheppey !! Warden Point, Isle of Sheppey, Kent. xanthilites bowerbank fossil crab. Isle of sheppey/London clay eocene . Part prepped with legs still to be uncovered. Reasonable carapace quality. Hard to find species. Cassiterite, this is a solid, heavy piece of fine grained ore in chlorite from Geevor mine, Pendeen, Cornwall. Location in the mine, 11th level, sims shaft. This is not dump material, it was Collected in the 80's, on the reverse side of the lable is dated July 1980. A very good and rich specimen. The specimen weighs 425 grams and is 8x6x5 cm Condition is Used. Dispatched with Royal Mail 2nd Class, which is £3.00. (Not £2.90 as ebay seems to think it is) No international post. If you require different postal arrangements and/or are buying more than one specimen (I have 6 specimens on offer) please message me and wait to the end of the bidding. Many thanks for looking and good luck with the bid. Age: Devonian Period. Finally after hundreds of thousands, or millions of years, the land is eroded and the fossil can be seen. Fossils can be as tiny as a grain of pollen or a seed for e.g. or as huge as a limb bone from a giant dinosaur. Ammonite Tragophylloceras fossil slab jurassic Charmouth Dorset !!!!!!!! From: Charmouth, Dorset, UK. Period: Jurassic. Age: 180 million years old. 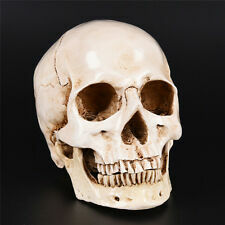 1x Human Lifesize Skull. Built to precise anatomical specifications. The top of the skull and jawbone can be removed (as shown in the pictures) for a view of the inside. New Arrival. In exceptional detail, this model displays all of the major bony landmarks, muscle insertions, fissures, processes, sutures and foramina. Brittle star starfish fossil Palaeocoma egertoni UK Jurassic Eype Dorset !!!!!! Species:Palaeocoma ( Ophioderma )egertoni. Beautiful example of this species of brittle star from the famous Eype starfish beds. Natural and genuine Polished Orthoceras fossil tower. The striking black and white patterns, coupled with the pleasing shape, make it an unusual display piece or a gift idea with a real difference.50 cm x 10 cm at widest points x 9 kg. Ammonite Promicroceras fossil slab jurassic Charmouth Lyme regis Dorset !!!!!!!! Promicroceras planicosta. Period: Jurassic. Very nice slab with 4 ammonites stacked together. See picture for details (scale in cm). This is an excellent Heliophyllum coral from the Devonian of New York. These really are large thin sections. In all cases the following applies.